The Beovision MX 7000 topped the MX television range for the years that it was available. The design was intended to close the gap that had existed between the MX and LX models in terms of sound quality. The LX range, with their 4 loudspeakers and pressure chamber enclosures (or bass-reflex in the case of the larger ones), had always offered far higher performance in this area. Text copyright © Beocentral. Unauthorised reproduction prohibited. The Beovision MX 7000 was the first MX model to include 4 loudspeakers. These were two woofers with rubber roll-edges and two small dome tweeters, similar to those fitted to the Beolab 8000 loudspeaker. Instead of the “log-line” loading tubes fitted to the loudspeakers of the other MX televisions, the MX 7000 used proper enclosures for the woofers too, though because of the shape of the cabinet they could not be made as large as those of the LX range. Text copyright © Beocentral. Unauthorised reproduction prohibited. What made the MX 7000’s audio section really different from any other Beovision was that the loudspeakers were “active”, with separate amplifiers for treble and bass and an electronic crossover. This arrangement had been seen before, but only in quality loudspeakers such as the Beolab 6000 and 8000. Because of this, the Beovision MX 7000 was not only an excellent television, it could also be used to very good effect in a Beolink system as an active loudspeaker in a linked room. Text copyright © Beocentral. Unauthorised reproduction prohibited. In all other respects the Beovision MX 7000 was identical to the MX 6000. 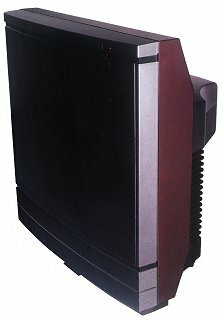 Outwardly, the MX 7000 was recognisable by a division running horizontally through the loudspeaker fret, and that the power indicator lamp in the infra-red receiver at the top showed red only, when the set was in use (in either audio or video mode) a green LED at each end of the loudspeaker fret became visible. Text copyright © Beocentral. Unauthorised reproduction prohibited. Early examples could be used with either the Beolink 1000 or Beolink 5000 terminals, the latter with two-way communication. When the Beo 4 terminal became the standard, the Beovision software was altered and the infra-red capability reduced to one-way only to suit. Later sets also included “improved teletext”, which progressively store all the pages for instant recall later. Text copyright © Beocentral. Unauthorised reproduction prohibited.